In this unique online magazine, you’ve got a rare opportunity to help a major researcher at one of the world’s leading research centers, the University of Michigan Institute for Social Research (ISR), reshape the way we, as Americans, understand the values that shape our lives. In more than five years of publication, 1,500 individual OurValues.org columns have raised questions about a wide range of the world’s most pressing issues: everything from the economy and immigration to religion and climate change. Each weekly series is guided by a new topic with questions that readers like you want to discuss. If you’re interested in civil dialogue on important issues, Our Values is just the place for you. WHO IS DR. WAYNE BAKER? Dr. Wayne Baker is an author and sociologist on the senior faculty of the University of Michigan Ross School of Business. He is also Professor of Sociology at the University of Michigan and Faculty Associate at the Institute for Social Research. 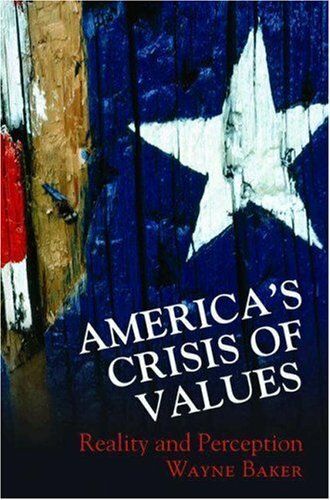 Dr. Baker has published over sixty academic articles and five books, including America’s Crisis of Values: Reality and Perception (Princeton University Press). He blogs five days a week at www.OurValues.org, an online experiment in civil dialog. Prior to joining the Michigan faculty, he was on the faculty at the University of Chicago business school. He earned his Ph.D. in sociology from Northwestern University and was a post-doctoral research fellow at Harvard University. Dr. Baker resides in Ann Arbor, Michigan with his wife Cheryl and their son. Finally, Here’s a Tip: The vast majority of our thousands of readers do not take time to add a Comment. So, taking time to express yourself not only contributes to the overall goals of OurValues.org—but you’ve also got a chance to influence many readers stopping by daily to check out what people—like you—are thinking.